We are all down with the flu here so it’s not been the greatest start to the new year. When I’m feeling under the weather I always crave a big bowl of soup. This is one of my favorite ways to get my boys to eat some veggies since neither one of them are big fans. 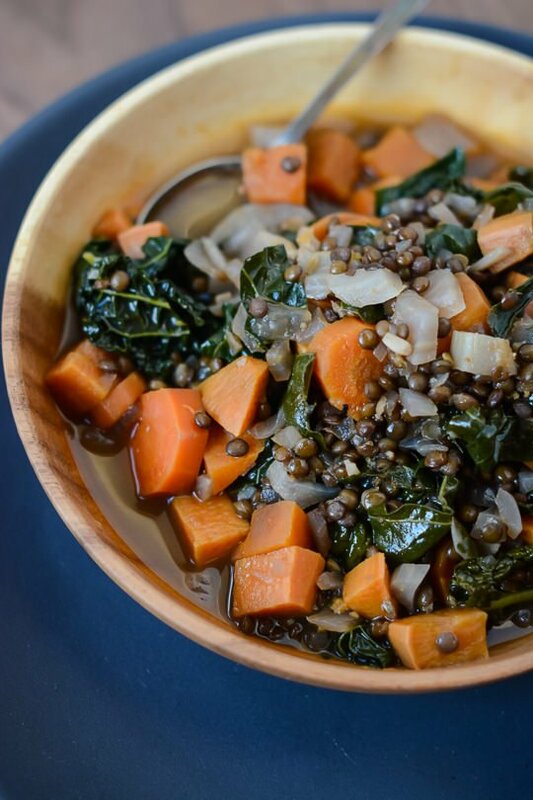 It also is a great immune booster since it’s loaded with sweet potatoes which are loaded with beta-carotene and kale is a great source of Iron. Since it’s a vegetarian soup I wanted to get a nice smoky flavor that I would normally find from bacon and Spanish paprika gives a nice depth of flavor. By all means if you don’t need it to be vegetarian add a few slices of chopped bacon to the onions and fennel mixture before you add the rest of the ingredients. I hope you are all off to a wonderful new year! Heat the tablespoon of olive oil over medium heat in a large dutch oven. Add the onions, carrots, fennel and garlic and cook until the vegetables are translucent and slightly softened. Add the paprika, fennel, salt, pepper and sherry vinegar and cook for 2-3 minutes longer until the mixture is fragrant. 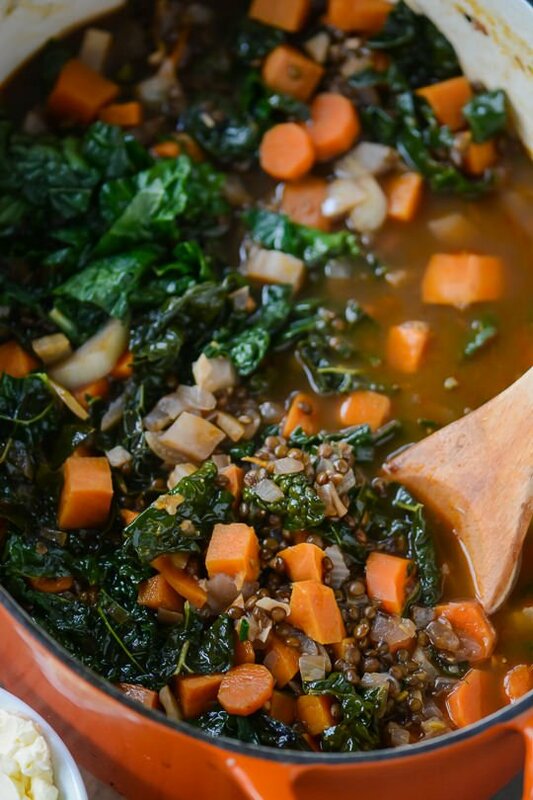 Add the lentils, sweet potatoes and vegetable broth and bring the mixture to a boil. Reduce the heat and continue to cook, partially covered for 20 minutes. 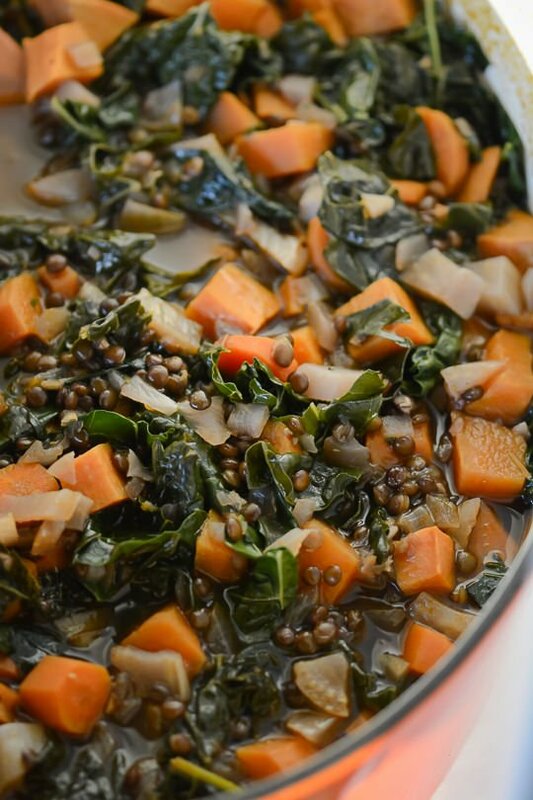 Stir in the kale and cook until lentils are tender and kale wilts, about 10-15 minutes longer. 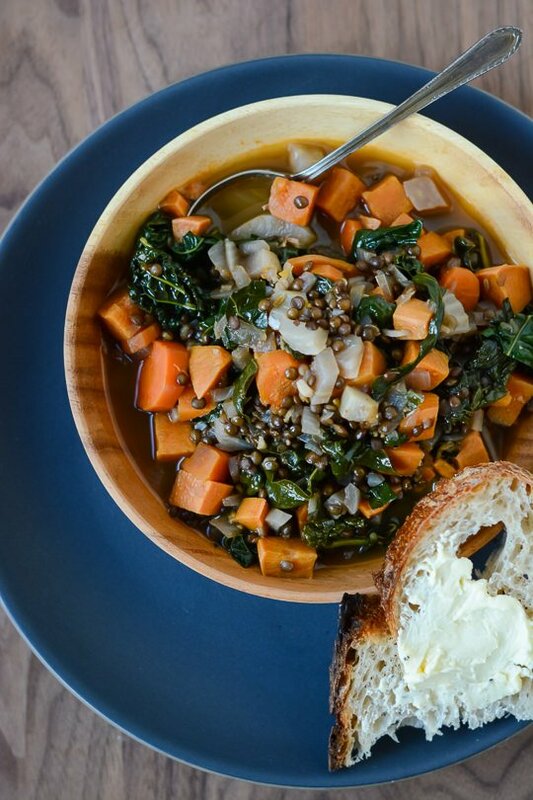 Serve the soup with a drizzle of good quality olive oil and additional sherry vinegar to taste. Thanks Greta! We are all slowly recovering and it’s been soup night every night for the last four days! This looks fantastic, especially with the paprika and sherry vinegar. I really enjoy a hearty lentil and fennel soup and also crave brothy, bold flavored soups when I’m sick, especially with a cold. Will definitely be making this one! I like full flavored soups so adding some type of acid is always a must for me. 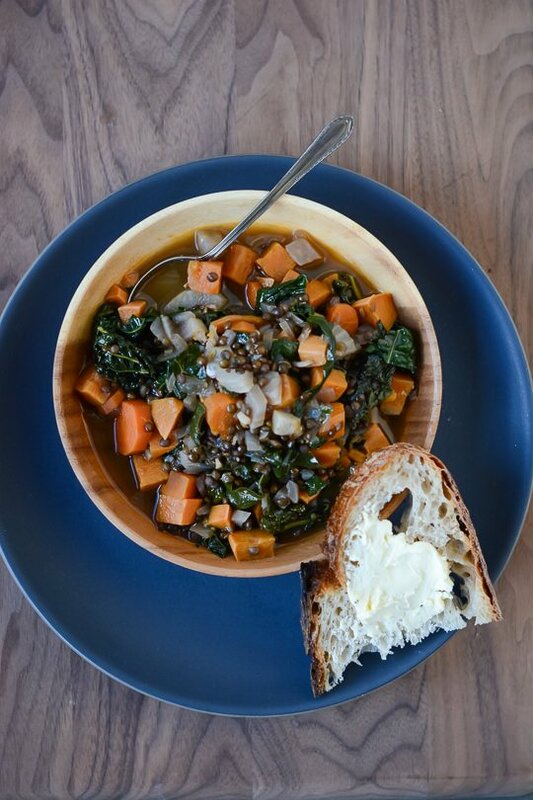 Sherry vinegar pairs really well with lentils, so I built the rest of the soup around those two ingredients! I just made this and am leaving this comment as I eat. YUM! This is such a winner. I did have to add a little more stock since I seem to have lost a lot of liquid. Maybe my partial cover was too partial? I found that I added a bit more stock when I reheated as well. The lentils absorbed more liquid than I expected. I will make sure to adjust the recipe. Thanks for trying the recipe! Just found and made this today – it’s very tasty and versatile. I like the depth of flavor it has which is kind of unusual for a vegan dish. I made a few changes – used equal parts balsamic vinegar and red wine vinegar because I didn’t have sherry vinegar on hand, added diced celery and courgette because I wanted to use mine before they went off, added a tablespoon of tomato paste to add just a bit more depth and acid, and finished the bowl with some fresh chopped parsley to bring out the brightness (but mostly to use the bit I had before it too went off) ;). 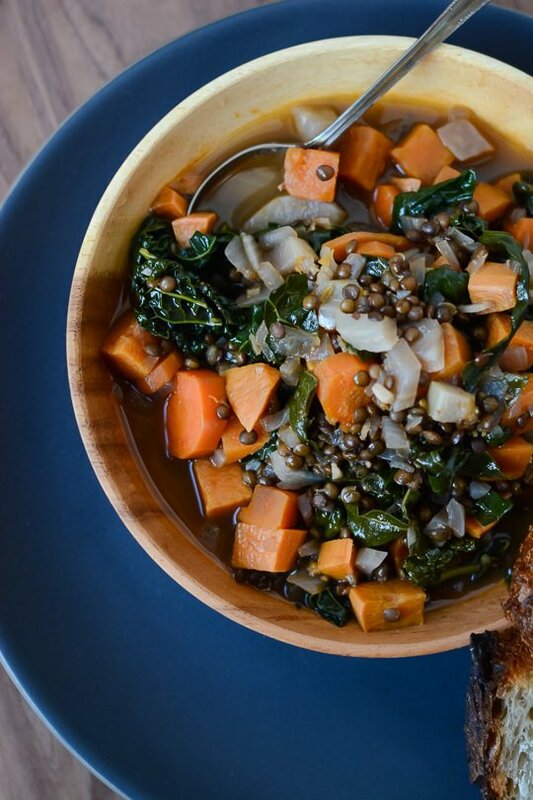 The dish manages to simultaneously taste delicious and healthy! 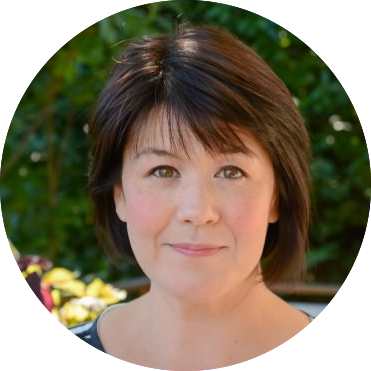 Thank you – will definitely make again! I love this recipe so much. It’s flavors are both layered and comforting. It has become a winter staple in my family. Thank you! I’m so glad you enjoyed the recipe. I love things that get better the longer they sit and I think this soup recipe really fits that bill! Have a great holiday and thanks again for trying the recipe!